People are going to unsubscribe from your email list. It’s sad, but it’s guaranteed to happen. No matter how great your email marketing is, you’re not going to retain 100 percent of your subscribers. Studies have placed the average unsubscribe rate between 0.19 percent and 0.52 percent per email sent. That means if you have a 2,000-person list, with every email you send, you’ll lose an average of about four to 10 subscribers. 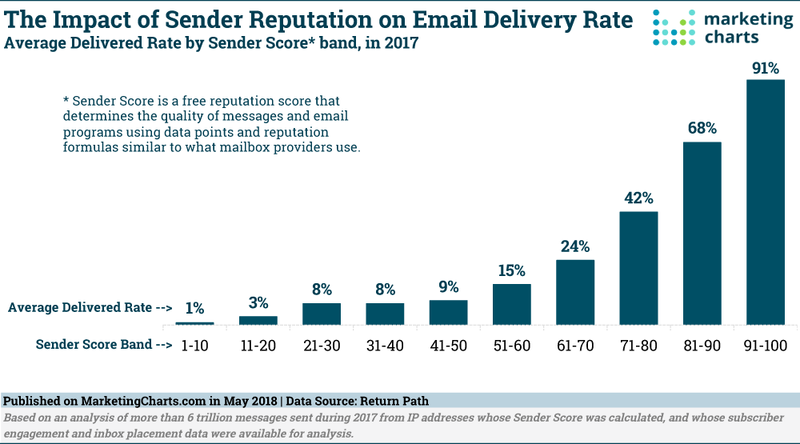 So if you send eight emails a month, the numbers say you’ll be dropping at least 30 subscribers—and maybe even closer to 80. That feels disheartening. But… it’s not necessarily all bad news. Obviously you don’t want to hemorrhage the subscribers you worked so hard to get, but not all subscribers are equally valuable. In fact, some of them might even be having a negative effect on your email marketing efforts. So as counterintuitive as it sounds, it’s not always a bad thing to lose a few subscribers. You just want to make sure you’re losing the right subscribers, which is to say the wrong subscribers for your company are exiting your list. In this article, we’ll examine what causes people to unsubscribe and discuss strategies for mitigating those scenarios. And we’ll also dive into the situations when it’s good to lose people from your list—and why you might even want to remove them yourself. We looked at four studies on why people unsubscribe, from GetApp, Marketing Sherpa, CMB, and Litmus. Though the studies were all phrased slightly different, taken in aggregate they revealed some clear trends. 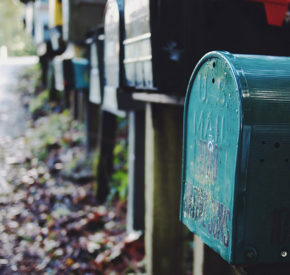 These are the five main reasons people unsubscribe from email marketing lists—plus some strategies to stop that churn. There’s nothing you can really do about the people who unsubscribe because they feel like they get too many emails in general. I mean, you could create a webinar on how to be more judicious with sharing your email address to reduce inbox oversaturation, but that seems like it would get roughly the same number of views a webinar about watching paint dry would get. But there are some tactics you can take to make your subscribers feel like they aren’t getting too many emails from you, specifically. First, examine your email marketing frequency. While the rule-of-thumb we’ve found is generally to err on the side of more, not fewer, emails, the correct frequency is impacted by everything from the size of your product catalog to your industry to the quality of your content. 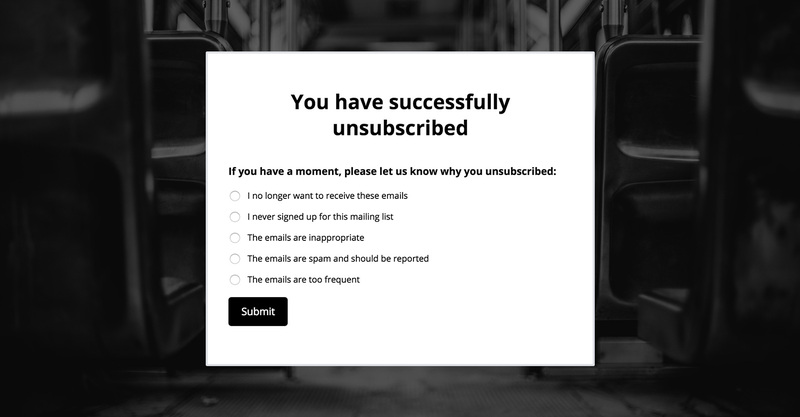 The top answer in every study on why people unsubscribe comes down to too many emails—so if you’re seeing high unsubscribe rates, the first triage step is to cut back on your frequency. See if your unsubscribe rates go down from there. But maybe they feel like they’re hearing from you too often. By giving your customers an opt-down option, it gives them a chance to stay on your list, but hear from you less frequently. And that means you can still market to them, albeit at a less torrid pace. A study by BlueHornet (PDF) found that 41 percent of people will consider opting down rather than opting out. That means, by offering a chance to opt-down to a lower frequency, you could save two out of every five subscribers you’d otherwise lose forever. In the studies on unsubscribing we looked at, after “too many emails,” the next-most common cause is irrelevant content. And that’s fair—if you live in Hawaii and a company won’t stop sending you emails advertising things like parkas, skis, or travel packages to Hawaii, why would you keep reading those emails? The keys to avoid sending irrelevant emails are two crucial email marketing techniques: Personalization and segmentation. 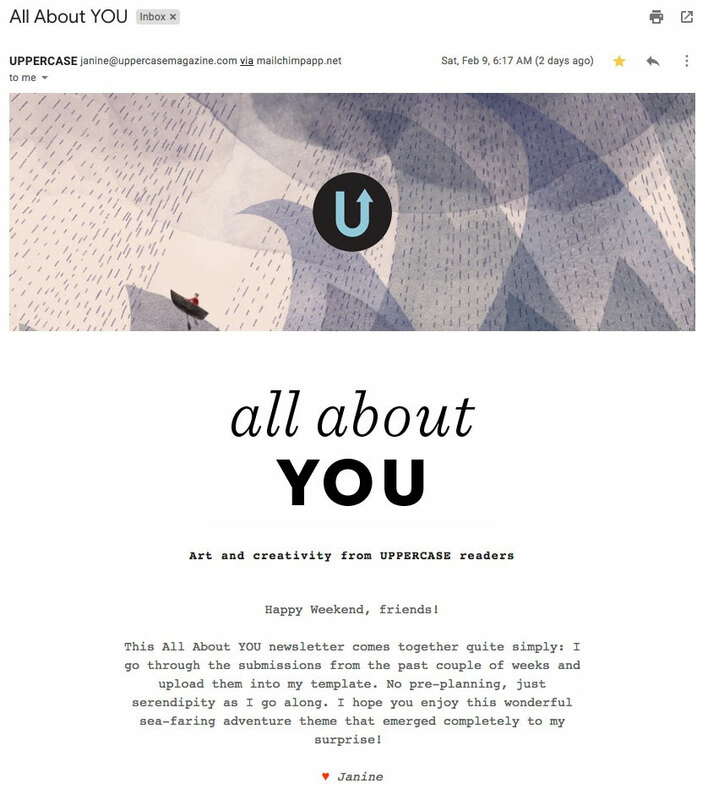 Personalization involves more than putting a subscriber’s name in the subject line (though that’s part of it! ); it’s sending your subscribers emails tailored to things like their preferences, interests, and purchase history. 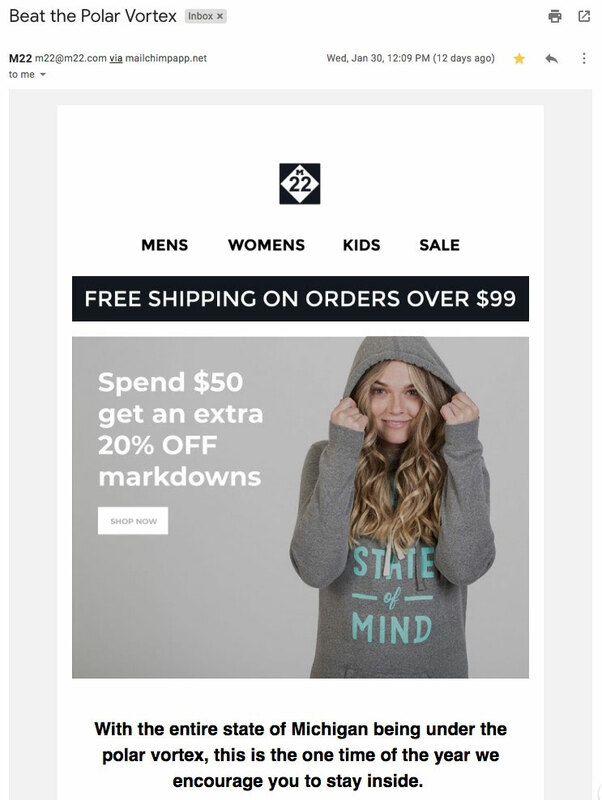 Now, that level of personalization can be difficult for a store with a smaller email marketing budget or less capability to do granular-level individual targeting. Sometimes it can also be gratuitous to send such specifically personalized emails when somewhat broader ones would do. And that’s where segmentation comes in.Segmentation is personalization at scale. You can use segmentation to split your audience in all sorts of different ways to make sure the emails they’re receiving have more targeted relevance. 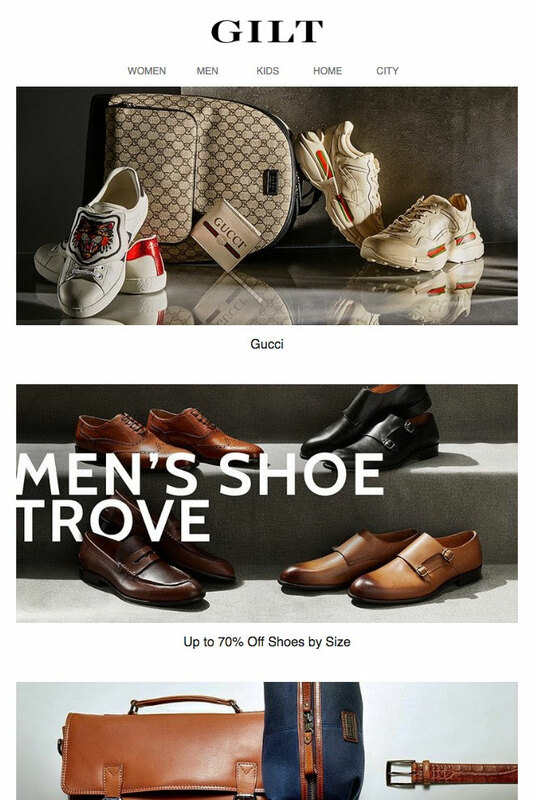 One common example: Make sure female customers get emails advertising female clothing and male customers get emails advertising male clothing, like in this email I received from Gilt. Ideally, your subscribers would be excited to see an email from you show up in their inbox because they know it’ll be interesting, or informative, or funny, or valuable, or helpful to their lives—or a combo of some or all of those. But when it’s none of those things, that’s when you can expect the subscriber exodus to commence. The biggest key to making sure your emails avoid that trap is having a legitimate reason to send each one. Advertising a new sale is definitely a reason. Announcing new features or tweaks to a product are good reasons. Your daily or weekly newsletter, filled with original content, is a great reason. Beyond things like that, it can be helpful to use an email marketing calendar to figure out other organic reasons to shoot off an email. Holidays, even non-traditional holidays like National Taco Day or Take Your Pet to a Petting Zoo Day, provide a good opportunity to send an email. Here are all the emails I received on March 14th that used “Pi Day” as an opportunity to send. The studies on why people unsubscribe also reference emails that are focused on the business’s needs, not the customer’s. Obviously you’re an eCommerce business, and you’re sending emails because you need people to come to your store to spend money. But the goal should be to drive customers to your store because the products you sell can fill a legitimate need in their life. That ties back to personalization and segmentation—advertising the right products to the right person. But it also means it can be worthwhile to send emails from time to time that aren’t focused on selling something and instead focus on getting to know your customers, celebrating them, finding out what they want, and determining how you can fit into that role in their life. We’ve hit the point where mobile-friendly design isn’t just a bonus, it’s a fundamental. If your emails aren’t designed for the small screen, it’s time to redesign. The good news is that most email marketing providers have templates that are completely responsive and mobile-friendly. But if you’re worried your designs, mobile-friendly or not, might be bad—too cluttered, too amateurish, too unfocused, whatever—try stripping things down to the fundamentals. Don’t worry about advanced email design techniques like the visual hierarchy, A/B tested analogous color pairings, or cross-browser CSS3 keyframe animation—stick to a good headline, great picture, a bit of compelling copy, and a strong call-to-action. Then build your emails back up from there. 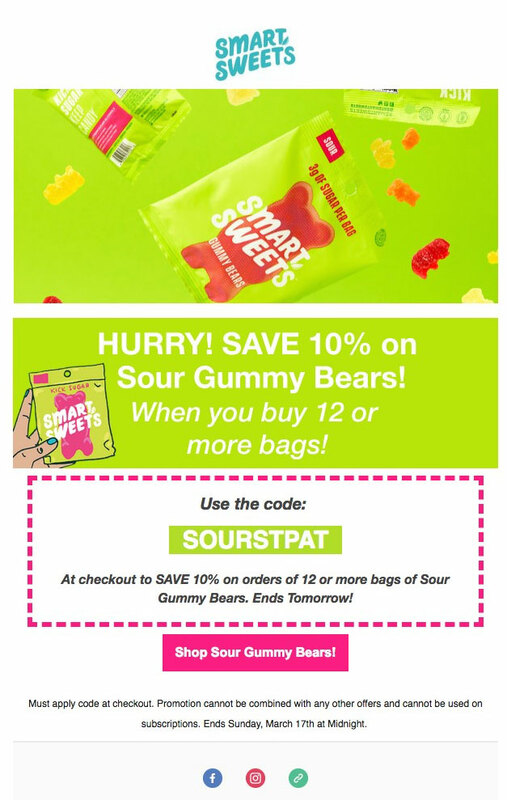 Check out this email from the candy company Smart Sweets. It’s ultra simple but looks great and accomplishes the one and only goal it has: Drive customers to buy stuff with a special discount. It’s happened to all of us: Suddenly some company starts sending you emails that you never asked for. Maybe they automatically subscribed you when you bought something, maybe they got your email by buying a list, or maybe your friends thought it’d be funny to sign you up to 17 different florists’ email lists after, in a regrettable moment of oversharing, you mentioned you love the smell of fresh-cut flowers filling the house in the morning. Err… anyway, it really doesn’t matter how good those marketing emails are—you didn’t want them, and that means it’s time for an instant unsubscribe and, potentially, angry feelings toward the company for emailing you without your expressed consent. That’s why, for the long-term health of your email list, it’s a good idea to do a double opt-in. That means a person doesn’t just have to enter their email on your site to subscribe, they also have to click a button in the subsequent confirmation email they receive to complete the subscription process. 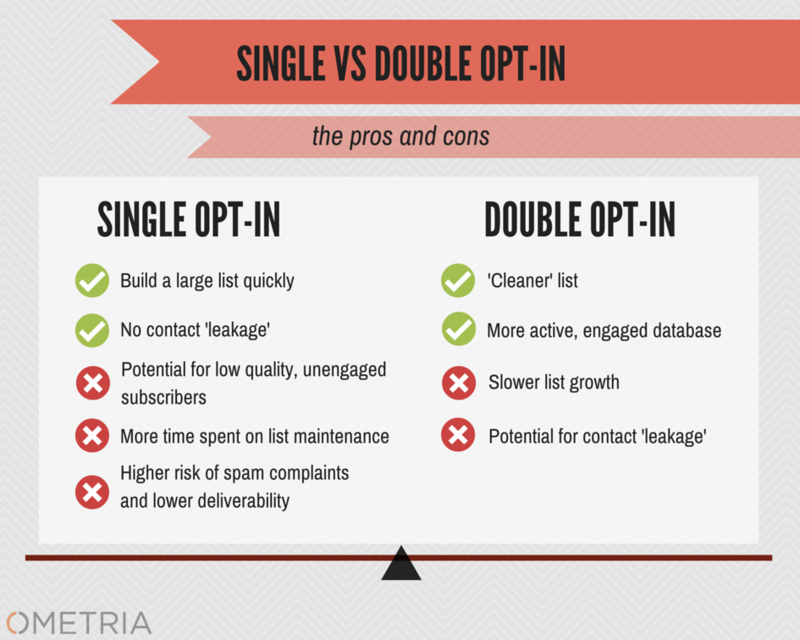 Most marketers’ first instinct is to avoid double opt-in. After all, the goal is to keep the subscription process as frictionless as possible, not inject extra doses of friction. And that’s not wrong; using a double opt-in will slow your growth. Studies have found that lists grow 20 to 30 percent faster with single opt-in rather than double. And roughly one out of five people won’t go through the second step of a double opt-in. But it all comes down to the quality of the subscribers. Yes, single opt-in will get you more; but double opt-in will get you people who really want what you’re sending. That means a list filled with engaged customers who are more likely to read your emails, click through, and purchase. It means a list with real email addresses, not fake or secondary ones people plugged in because you had a pop-up offering a 15 percent discount code for subscribing or you were running a contest they wanted to enter several times. It means a list of subscribers who are less likely to report you as spam, a list you don’t have to spend as much time maintaining to get rid of addresses that are bouncing, and a list of people who don’t resent you for emailing them without explicit permission. Here’s why you actually want some people to leave you list: A large email list of lukewarm or cold leads won’t be as valuable to you as a somewhat smaller list of active, engaged leads. Spam reports are also poison to email marketers. They’re another direct path to the junk folder and deliverability issues, and if you use a service to send your emails, spam complaints could lead them to suspend your account. Something else you need to watch out for are bounces and spam traps. Bounces happen when a subscriber’s email account is filled up or the account is canceled. Those canceled emails are sometimes then recycled into spam traps by ISPs; and when you send marketing emails to a spam trap address, it’s a sign to the ISP that your emails are junk. A few years back, Hubspot decided it was time to pare down their list of 550,000 subscribers. They noticed their engagement wasn’t where they wanted it to be and their deliverability was starting to slip. So they sent a re-engagement campaign asking dormant subscribers if they were still interested in receiving emails. Some were, but a lot weren’t. So… Hubspot unsubscribed 45 percent of their own list. That works out to 250,000 people. They also looked at why people could be losing interest, and they determined it was mainly because they were sending four emails a day. (Which is just way, way too many.) They decided to drop that down to one a day. And with their new, “tight” list of 300,000 interested subscribers and one email a day—they didn’t see any negative impact on business. Traffic on the site broke even, which was their biggest concern going into the project. And that makes sense; all those people they pruned from the list weren’t visiting their site in the first place, and the subscribers that remained were the ones who had been driving traffic all along. They also got a ton of positive feedback from their readers. So while they had significantly fewer subscribers, they now had a much higher percentage of engaged—and happy—subscribers. Having a list full of good prospects is a key to improving your email marketing, because now you can genuinely figure out what isn’t working. Things like your click-through rates and return on investment become more relevant, because you can really see what your best customers are and aren’t responding to. And from there, you can determine what kind of content is going to resonate the best and be the most effective. Everyone has a reason for clicking an unsubscribe link. Wouldn’t it be good to know it? Consider adding a one-question survey to your unsubscribe page asking why the person chose to get off your list. Sure, not everyone will respond, but those who do will provide you with really valuable feedback on what you’re doing wrong. If a high percentage cite your frequency, it’s time to send fewer emails. If a lot of people complain about the quality of your content, address your strategy. If you get a common complaint that they don’t remember signing up, consider going to a double opt-in process. But even if you don’t run a survey, trends in unsubscribe numbers can still help illuminate some major issues. 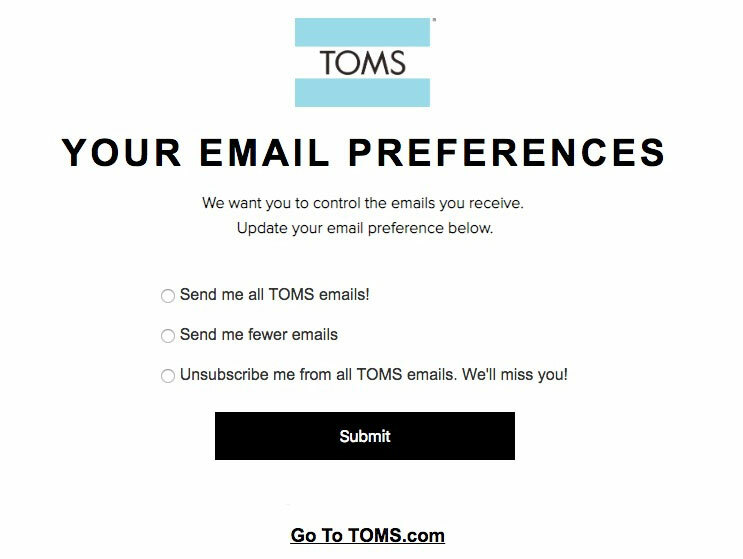 If one email leads to an especially high jump in unsubscribes, examine that email and figure out what went wrong. Was it too self-promotional? Inappropriate? Polarizing? Poorly designed? You can also use unsubscribe trends to help determine your ideal email frequency. If you retain way more subscribers by sending two emails a week than three, there’s your sweet spot. Some unsubscribes should be expected—roughly between 0.19 percent and 0.52 percent on every email you send. And there are some universal reasons why people unsubscribe—and ways to remedy them. Too many emails from you (or in general). Fix this by experimenting with different email frequencies, and by offering an opt-down option for subscribers to receive fewer messages. Irrelevant emails. Fix this by segmenting your list and focusing more on personalization to make sure your emails are tailored to each specific subscriber’s needs. Bad content. Make sure every email you send has a purpose and a value, and that they focus on the customers’ needs, not just your own. Bad design. Make sure you’re using mobile-friendly templates and strip down your design to the basics if you have to. I didn’t realize I subscribed. Consider using a double opt-in subscribe process, which will yield lower subscriber numbers but a higher-quality list. But remember, when you do lose people from your list, that can sometimes be a good thing. Improve deliverability by having fewer unopened emails, bounces, and spam reports—and avoid falling into spam traps. Pare down your list to a more engaged group, which helps you target your best customers and better gauge the effectiveness of your email marketing strategies. Get feedback, both explicitly and implied, on why people are unsubscribing from your list and how you can fix it.